There is probably no other religion on Earth that is more widespread and known than the Catholic Church. As I write this, the media is gathering in Rome anticipating the election of a new Pope due to the fact that Pope Benedict XVI retired. (Ruth, Lisa M, Wash. Times) The Catholic Church is the largest religion on Earth with over 1.5 billion members. It is also the oldest western religion. One can say, based on history that it has built western society as we know it today. The Catholic Church is a revealed religion. (CCC. Para. 813) It can be traced back to Jesus Christ and the Apostles. (Bokenkotter, pg1) The Church states that it has the four marks of the true Church: One, Holy, Catholic, and Apostolic. (CCC. Para. 865) Jesus Christ is thought to be by billions, the Son of God. The Jews prior to Christ were expecting a Messiah or Savior. This Messiah was thought to be a warrior who would rescue Israel similarly like Moses did in the book of Exodus found in the Bible. (Levine, USCatholic.org) However, the one claming to be the Messiah - or “chosen/anointed one” - was a poor carpenter named Jesus Christ. (Bible Catholic Pastoral Edition, Mark 6:1-3 [p.83-84]) This would cause scandal among the Jews of the time who expected a man with a sword in hand that would defeat the oppressors of the nation of Israel. One of them named Simon was a fisherman and the oldest. Jesus would change his name to Peter which means “rock.” He would also tell Peter that He would give him the keys of the kingdom of Heaven and Earth. Whatever Peter changed would be changed in heaven and whatever he left untouched would be left untouched. (Bible Catholic Pastoral Edition, Matthew 16:18-19 [p.42]). This giving of the keys originates from Isaiah 22:20-22 in the Old Testament. (Bible Catholic Pastoral Edition, Isaiah 22:22 [p.546]) Hezekiah gave the keys to the kingdom of David to a servant named Eliakim to be the prime minister. The keys are also a symbol of succession. The Catholic Church teaches that Peter would have a specific primal role in the Church as the visible head of it. This role would be defined as the Papacy. (CCC paragraph 881) Jesus would then continue stating that the gates of hell would not prevail against the Church. After Pentecost, the Apostles would spread around the region and preach the message of Jesus Christ. They would baptize, and celebrate primitive versions of what are called “sacraments,” or visible signs of God’s grace. (Catholic Pastoral Edition, Acts 20:7 [p.273], Acts 19:5 [p.270]; Catechism of the Catholic Church, paragraph 774) The Catholic Church would establish its center in Rome. (Bokenkotter, Pg. 16-27) Peter and another disciple named Paul who was not originally part of the Apostles founded the Church there. This is why the Church is centered in Vatican City, Rome. According to Origen of Alexandria, Peter was crucified on the land upside-down. He did not want to die in the same manner as Christ so he requested to be crucified in this manner. 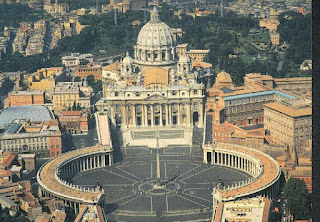 His remains would be buried where the basilica of St. Peter’s is now. (Bokenkotter, 42) His “cathedra” or chair is also preserved there. Moreover, some erroneously call the Catholic Church, the “Roman Catholic Church;” however, this is not the proper title. The Catholic Church is a collection of about 22 different churches or rites. (CCC, Para.1203) Latin is one of those rites which originated in Rome as the official vernacular. Each rite has a distinct way of having Liturgy, or public service/worship. In addition to these virtues, the Catholic Church offers the seven sacraments which are divided into three categories: Initiation, Healing and Vocation. Baptism, Confirmation and the Holy Eucharist are the Sacraments of initiation. (CCC. Para. 1113) They leave an indelible mark on the souls of believers who receive them. (CCC. Para. 698) Anointing of the Sick and Penance are the Sacraments of Healing. One offers comfort to the sick and prepares them for death while the other removes all sin when a believer confesses his or her sins to a priest. (CCC. Para. 1421) Lastly, Holy Matrimony and Holy Orders are the Vocation Sacraments. God can call one to marry the opposite gender, or a male to become a deacon or priest via ordination in Holy Orders. Only celibate men can become deacons, priests, bishops, cardinals and pope. (CCC. Para. 1580, 1598) Women are called to the religious life, but this is not the same as Holy Orders. The Mother of Christ, commonly referred to as the Virgin Mary holds a special veneration by Catholics. (CCC. Para. 721) It is believed that she has appeared to specific individuals throughout the centuries. Many shrines were built on or near the spot where she had appeared. In addition to this, Catholics stress the important of a prayer life. Liturgy is the official worship of the Church. (CCC. Para. 1136) Catholics are required to attend Mass on Sundays and holy days of obligation. (CCC. Para. 2042) They must frequent the Sacraments of Penance and Holy Eucharist and must take part in good works. Sacramentals, or objects and actions that are considered reminders of the sacred and bring blessings are used. (CCC. Para. 1677) Popular sacramentals are medals of saints, rosary beads, chaplets, scapulars and holy water. The Catholic Church teaches that it is the Mystical body of Christ. Christ is its head, but a visible head remains on Earth called the Pontiff, Vicar of Christ or Pope. (CCC. Para. 1119) The Pope is an ordained man who is elected by the Cardinals, or princes of the Church. The Cardinals vote among themselves who will replace a Pope. The Church has had 266 Popes from St. Peter to Pope Benedict XVI. Recently, Pope Benedict XVI retired and a conclave was held which is the ceremony from which a new Pope is elected. The Cardinal of Argentina, Jorge Mario Bergoglio was elected on March 13, 2013 and took the name of Pope Francis. In closing, the Catholic Church is a religion that is well organized and has a long history. It was difficult attempting to summarize the Catholic religion because of the volumes of information on it. I think the religion is rational and if one observes it correctly, one will benefit greatly. Its ideas are often misunderstood. The Church has done much for society and is the largest charitable organization in the world. It provides both spiritual and material needs to all peoples, even non-Catholics. The Church educates people of all races, ages, genders, faith and no faith. To my knowledge, the Catholic Church is the only religion that promotes science and even has its own observatory. Despite the bad reputation some of its members have given the Church, the Church deserves a lot of credit for many good things. Catholic Church, Catechism of the Catholic Church. XVI, Benedict. Introduction to Christianity. Revised.